Also known as scented mayweed, German chamomile’s apple-scented fragrance is familiar to herbal tea drinkers, and is used both for digestive disorders and nervous problems and as an ingredient in anti-inflammatory creams and ointments. Its close relation, Roman chamomile (Chamaemelum nobile), is used in similar ways. It is native to Europe, western Asia, and India. Camomile makes a delightfully fragrant tea, calming the stomach. Take after evening meal to improve digestion. The herb will calm the nervousness leftover from a busy day and promote deep sleep. Chamomile is antispasmodic to the intestinal tract and helps heal gastric and duodenal ulcers. In this application, it combines well with liquorice. Pour 1 cup boiling water over 2 tsp of flowers and leaves and take for mild digestive problems or insomnia. 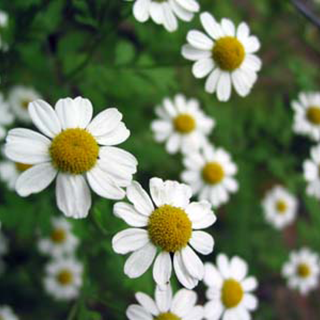 German chamomile is a gentle herb that is suitable for children at reduced doses. Add 2 tsp of flowers or 5 drops of essential oil to a basin of boiling water for hay fever or mild asthma. Take 2 tsp (10ml) of the flower tincture 3 times daily for irritable bowel syndrome or nervous tension. Add 4–5 drops of essential oil to the bath to heal wounds or soothe the skin. Add 1 cup of strained infusion to a baby’s bath at night to encourage sleep. Use on insect bites, wounds, or eczema. Use 2 tsp (10ml) of tincture in a glass of warm water, or 1 cup of standard infusion for gum disease and mouth inflammations or as a gargle for sore throats. Prefers well-drained, neutral to slightly acid soil, and a sunny site. Sow seeds where you want them to grow in autumn or spring. It self-seeds freely. Gather the entire flower at peak development in the summer, in the morning after the dew has barely evaporated and use fresh or dried.